US Patent Describing Sony Black Screen Technology? A few weeks back, Gizmodo posted this photo of Sony’s black screen technology. This screen somehow absorbs ambient light… anyways, grid1010 over at the AVS Forum found Patent #6,769,774 which describes the technology that closely matches what Sony is doing. The interesting thing to note is that the Patent is assigned to IBM. 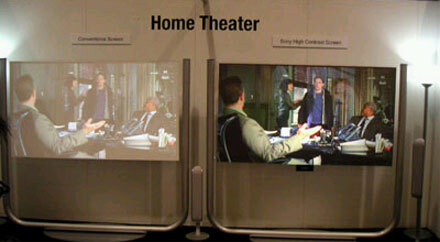 A method and systems for projecting an image onto a screen in high ambient light. The image is composed as pixels comprising selected intensities of preselected bands of visible light. The pixels are created by modulating three frequencies of light corresponding to hues in the red, green, and blue spectrum. The modulated light selectively generates pixels of a frame of the image. A diffusive projection screen has a triple bandpass light filter surface that selectively transmits preselected bands of light frequencies around the red, green, and blue spectrums of the modulated light source. The triple bandpass light filter is used with projection screens in front and rear projection systems. The hues of red, green, and blue may be generated from LEDs or from extracting the frequencies from a broadband source. The modulator system may comprise a time multiplexed single modulator design or a triple modulator design. Sony’s Black Screen In Hilton Hotels?